If growing an army of good gut bacteria and eating probiotic foods is the new health fad, then feeding your gut bacteria prebiotic foods that will help make them strong and equipped to protect you isn't far behind. Rowdy makes prebiotic energy bars they say your bacterial troops will be very happy to see served at the canteen. Your mouth and teeth shouldn't be too put out preparing Rowdy Prebiotic Bars for them to eat either. What Are Probiotic and Prebiotic Foods? A quick recap on probiotic and prebiotic: probiotic foods contain live strains of "good" bacteria that support gut health and, studies are finding, may help prevent a range of maladies, from obesity to depression. Yogurt is the most famous bearer of bacteria, but fermented foods, such as kraut and kimchi, are rising in popularity, especially amongst people who don't eat dairy. Prebiotic foods are those the probiotics particularly like to eat, grub that helps your gut bacteria thrive. They are typically foods rich in fibers your body cannot digest, but your friendly neighborhood gut bacteria can, and cannot wait to lay into. Chicory root, jicama, onions, garlic, and sunchokes are some examples of prebiotic foods. 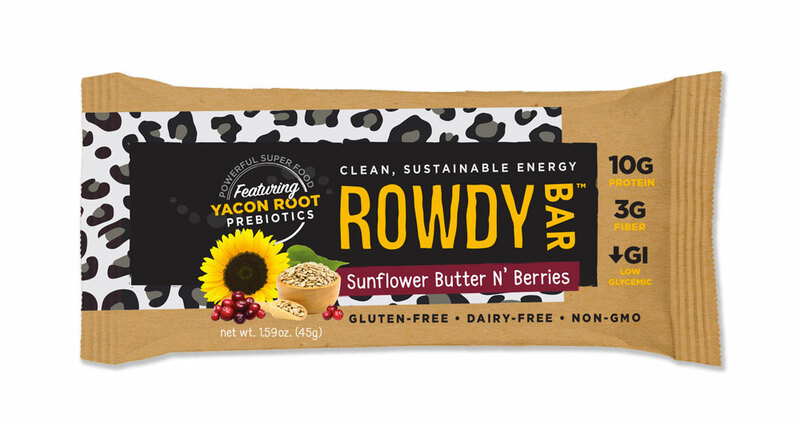 What's So Prebiotic About Rowdy Bars? 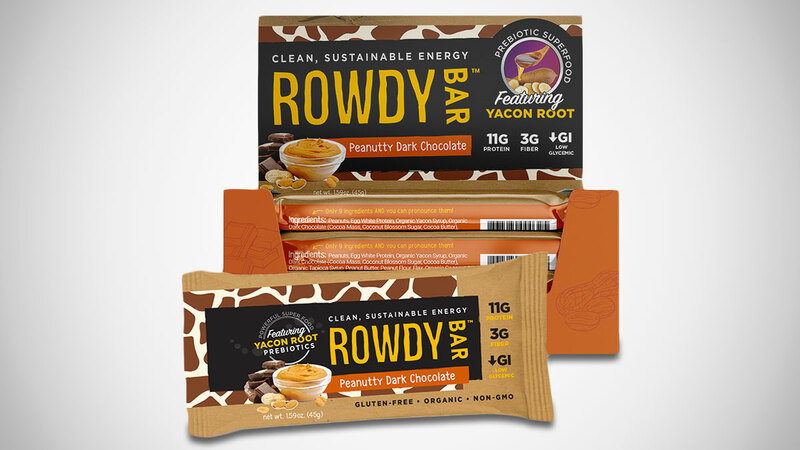 While Rowdy bars do contain protein (10 grams), are low-glycemic and Paleo-friendly, and are mad with just a handful of natural ingredients, they separate themselves from the array of energy bars already on the market by focusing on ingredients "that help you build a balanced microbiome." The Rowdy Prebiotic Bar star: yacon root. Yacon root is a type of perennial daisy that comes from the Andes mountains. It is particularly rich in prebiotic fructooligosaccharides (FOS) and inulin fibers. FOS in particular is interesting because it is a sugar your body cannot digest, meaning that it tastes sweet but leaves behind no sugar calories in its path through your system. Converted to yacon root syrup, a base ingredient of Rowdy Prebiotic Bars, it's a low-glycemic sweetener that, unlike aspartame and Sucralose, is also all-natural. 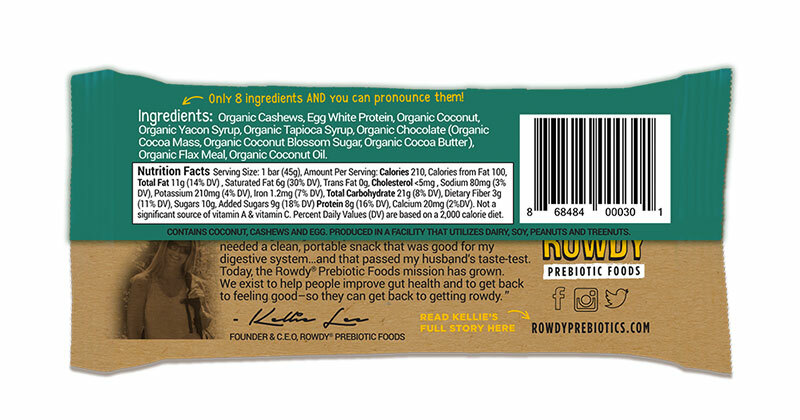 Rowdy Prebiotic Bars contain between 8 and 10 ingredients depending on the flavor. All start with egg white protein and yacon syrup, and have some tapioca syrup, flax meal, and coconut oil. From there the ingredients vary by the flavor. My surprise favorite, Sunflower Butter N' Berries, has sunflower seeds and butter, dried cranberries, and pomegranate. I did not know I liked me some sunflower so much, but the combination here makes me want to steal some of the neighbors' flowers and grill them up with dinner. Those with less of a floral tooth can also get Rowdy Prebiotic Bars in Chocolate Coconut Cashew (available here on Amazon) and Peanutty Dark Chocolate, each with respective ingredients corresponding to their name. 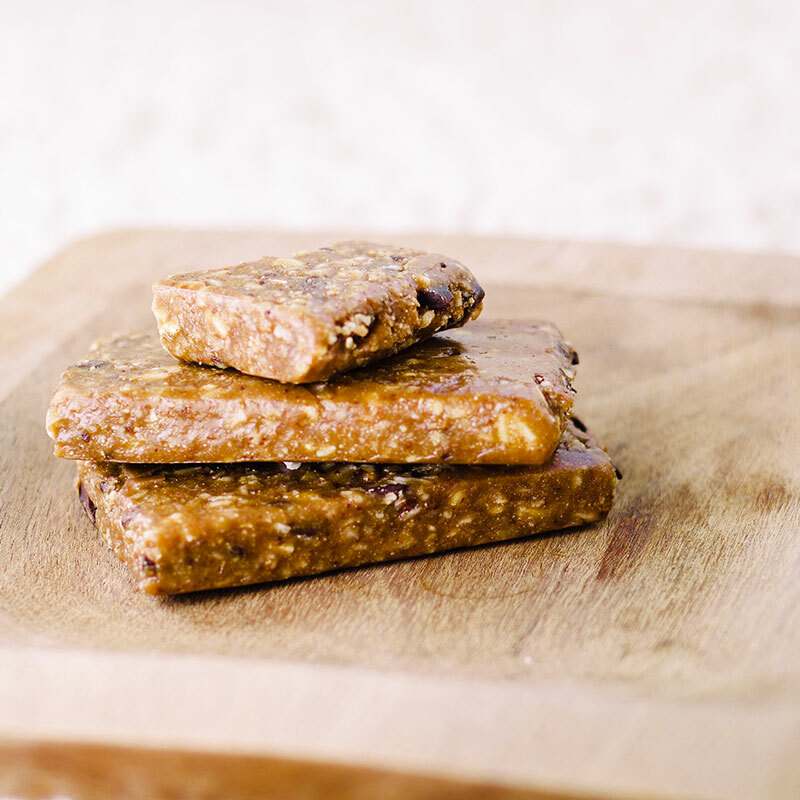 Rowdy Prebiotic Bars have between 190 and 210 calories, and 6 to 11 grams of fat apiece. They sell in boxes of 12.